Like all Salt Table Blends …100% natural, hand blended in Savannah, and this one comes complete with a grinder top. This blend combines delicious Himalayan pink salt with Italian spices and pepper. If you love Italian (and most people do), then you’ll be very pleased with Carol’s version complete with a Southern twist! 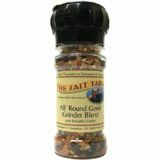 This blend will add great flavor to egg salad, sandwich spreads, or just grind on fresh tomatoes. Of course, it works great in pasta sauces. Makes great roasted potatoes with just a little olive oil. 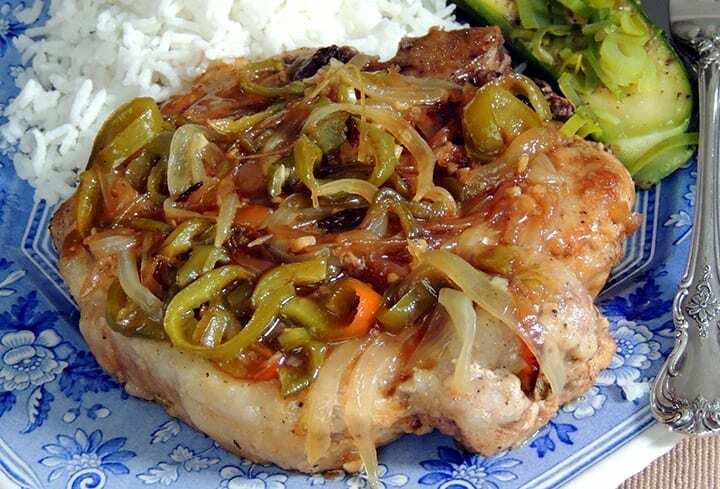 Smothered pork chops with peppers and onions are an old Lowcountry favorite, and Salt Table’s Savannah Spanish Moss Blend is the perfect blend for so many of the Lowcountry’s traditional dishes from seafood to chicken to pork, especially those containing pork, onions, and sweet peppers. Other appropriate blends for this would be River Street Cobblestone Blend, All Round Good Grinder Blend, and Southern Italian Blend. Trim the excess fat from the chops and season them well with Spanish Moss Blend, River Street Cobblestone Blend, All Round Good Grinder Blend, or Southern Italian Blend. Heat the fat in a deep, lidded 2-quart braising or sauté pan or lidded 9-inch skillet over medium heat. When it’s hot, roll the chops in flour, shake off the excess, and put in the pan. Brown them well both sides well, about 3 minutes per side, and remove to them to a plate or platter. Add onions and peppers and sauté until softened, but not colored, about 4 minutes. Push the vegetables to one side, return the chop to pan, and scoop vegetables on top of chop. Add enough broth to half cover chops, let it come to a boil, then cover and reduce heat to low. Simmer until fork tender, replenishing liquid as needed with broth or water, about 1 hour. Remove the chops to a warm platter. If pan juices are too thin, raise the heat and boil until lightly reduced and thickened. Pour over chops and enjoy at once. Salt Table River Street Cobblestone Blend, All Round Good Grinder Blend, and Southern Italian Blend are all great alternatives. To spice it up, try it with Savannah Sizzle Seasoning Blend. Trim the silverskin and any excess fat from the pork and cut it into uniform bite-sized chunks. Wrap in paper towels and thoroughly pat dry. Film pan with olive oil and put over medium high heat. When hot, add the pork and sauté until well browned (about 3 minutes), adjust heat to medium, and continue until done to your taste, about 2 minutes for medium/medium-well. Remove from pan. Add the shallot and sauté until golden, about 2 minutes, then deglaze with chicken broth and cook until reduced by 2/3. 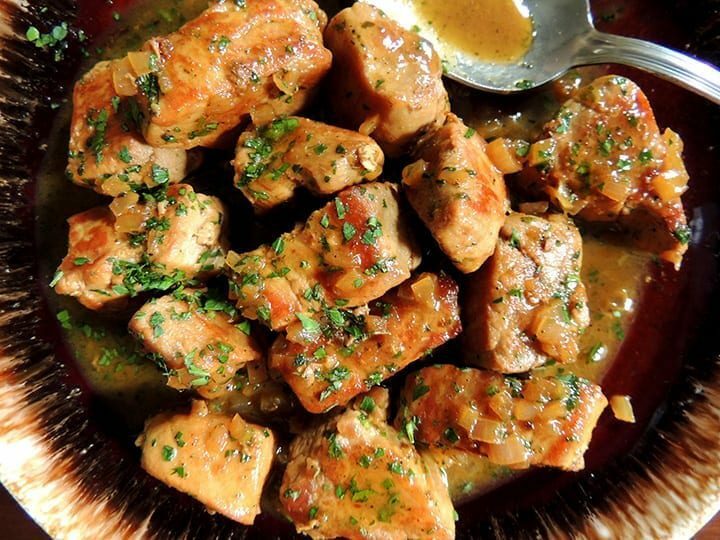 Stir in any accumulated juice from the meat and turn off the heat, return the pork to pan, add optional herbs, toss, and serve. Wine Déglacé: Allow ½ cup dry white wine, dry white vermouth, dry sherry, or Madeira. After the shallot is golden in step 3, deglaze the pan with wine, bring to boil, then add the broth and boil, stirring and scraping pan, until reduced and syrupy, add any accumulated juice from the meat, and turn off the heat. Whisk in the River Street Cobblestone Blend, All Round Good Grinder Blend, and Southern Italian Blend, or spice it up with Savannah Sizzle Seasoning Blend., if using, and if you want to enrich it, whisk in 1-4 tablespoons cold unsalted butter (cut into chunks, to suit your taste). This simple, intimate sauté for two has all the flavor of a hearty, slow-cooked beef stew takes in just minutes from start to finish. 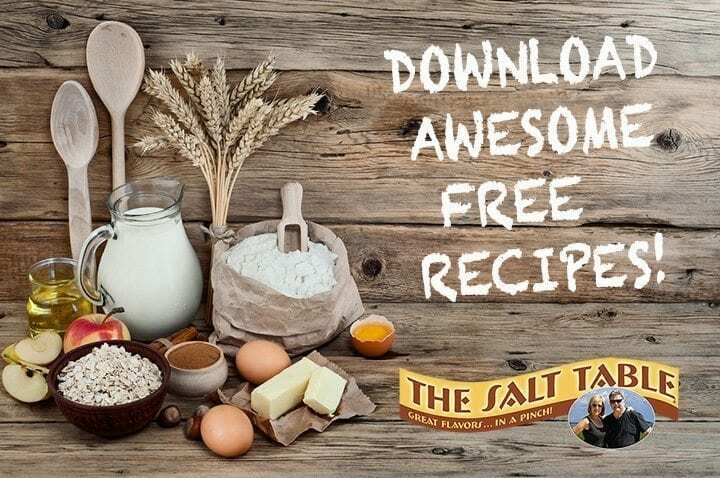 The Salt Table’s seasoning blends make it especially quick and easy, and the flavor can be varied simply by changing the blend. Savannah Spanish Moss Blend lends a rich, autumnal flavor to the beef, but River Street Cobblestone Blend, Southern Italian Blend and All Round Good Grinder Blend would also be great. For a spicy finish, try substituting Savannah Sizzle Seasoning Blend. Trim any fat and gristle from the beef and cut it into uniform 1-inch cubes. Wrap in paper towels and thoroughly pat dry. Film the pan with olive oil and put it over medium high heat. When hot, add the beef and sauté until it’s browned and done to your taste, about 3-4 minutes for medium rare. For medium-well to well done, adjust heat to medium to keep outside from browning too much and sauté 2-3 minutes longer. Remove it from the pan. Add the shallot and sauté until golden, about 2 minutes, then deglaze pan with beef broth (¼ cup for 1 serving, ½ cup for 2). Bring to boil, stirring and scraping, and boil until reduced by 2/3. Add any accumulated juice from meat, stir, and turn off heat. Return beef to pan, add optional herbs, toss to coat, and serve. To make it with a red wine déglacé: Allow ½ cup pinot noir or cabernet. After the shallot is golden, deglaze the pan with wine, bring to boil, then add broth and boil, stirring and scraping pan, until it’s reduced and syrupy. Add any accumulated juice from the meat, let it heat through, and turn off the heat. If you want it enriched, whisk in from 1 to 4 tablespoons cold unsalted butter (cut into chunks). 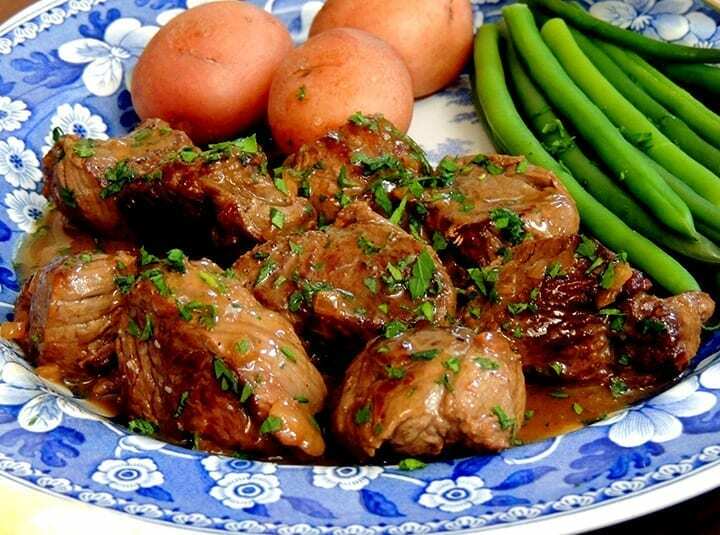 Whisk in the herbs, return the beef to the pan, toss to coat it, and serve. 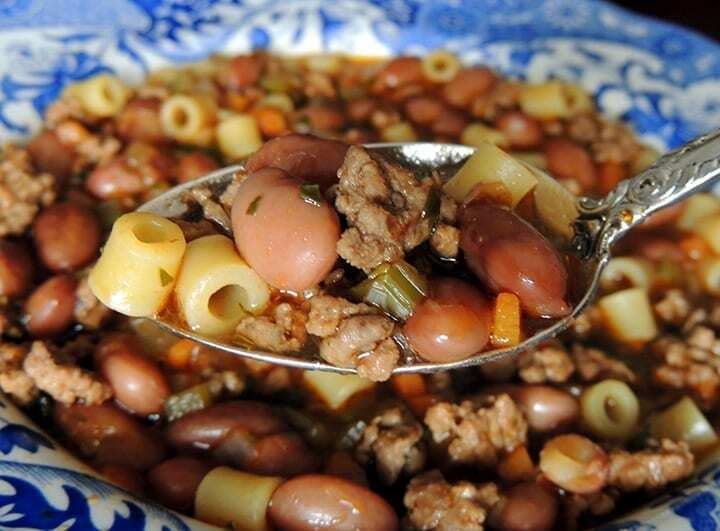 This is my own version of “pasta e fagioli,” a perennially popular thick Italian soup. 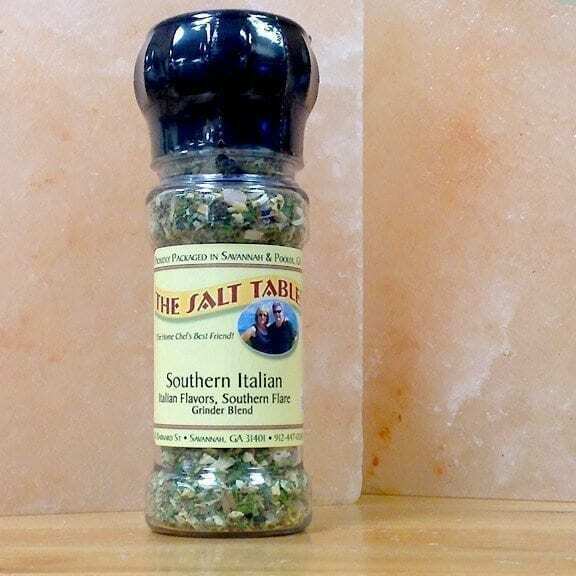 The seasoning is simple and easy with Salt Table’s Southern Italian Blend, but it would also be good made with River Street Cobblestone or Savannah Spanish Moss Blends. Put the oil in a large (at least 4 quart) heavy-bottomed pot over medium heat. When it’s hot but not smoking, add the beef and brown it lightly, crumbling with fork or spatula. Remove the beef with a slotted spoon and season it liberally with Southern Italian Blend. Add the onion to the pan and sauté until translucent, about 4 minutes, then add the celery and carrot and sauté until they’re softened and the onion is pale gold, about 4 minutes more. Return the meat to the pot and stir in the tomato paste and broth. Raise the heat and bring it to simmer, then adjust the heat and simmer gently 20 minutes. Raise the heat once more and add the beans, season well with Southern Italian blend, and bring back to simmer. Adjust heat and simmer 10-15 minutes longer. Taste and adjust the seasoning blend, adding slightly more than you think it will need since the pasta will somewhat dilute the seasoning. Stir in the pasta and cook, stirring occasionally, until al dente, using the package directions as rough guide for time. Stir in the parsley and serve with cheese passed separately. 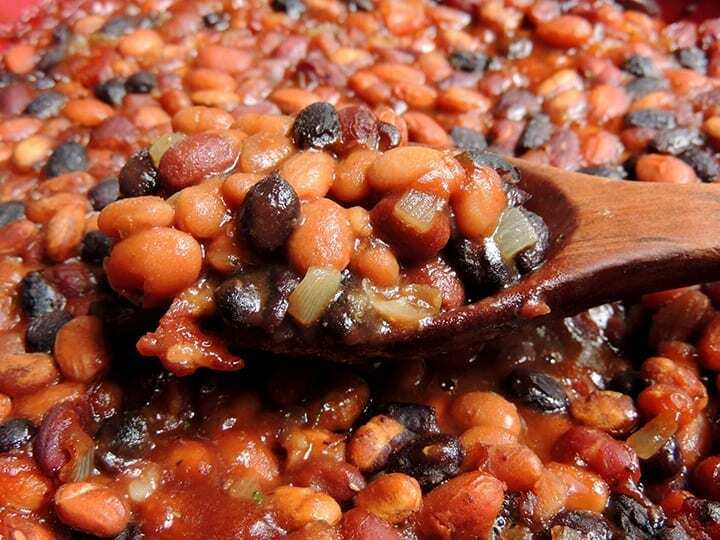 This old summer cookout favorite gets a fresh lift by using a blend of four kinds of beans that are subtly enhanced by The Salt Table’s Hostess City Southern Hospitality Blend. They go together quickly and can bake while you’re getting the grill ready. Other blends that would work well here include The Salt Table’s Southern Spring Blend, Southern Italian Blend, and, of course, All ‘Round Good Grinder Blend. Position a rack in the center of the oven and preheat it to 350° F. Put the baked beans with their sauce, pintos, red, and black beans into a 9-inch square or 2½ quart casserole and gently toss to mix. But the bacon in a 9-inch skillet over medium heat and sauté until it is browned and its fat is rendered. Spoon off all but a tablespoon of the fat, add the onion, and sauté until the onion is softened and golden. Turn off the heat and transfer the bacon and onions to the casserole. Add the ketchup, brown sugar, and mustard, if using and season liberally with Salt Table’s Hostess City Southern Hospitality Blend. Gently but thoroughly mix, level the top with the back of the spoon, taste and adjust the seasoning blend, and bake until bubbly to the center and lightly crusted over on top, about 1 hour. 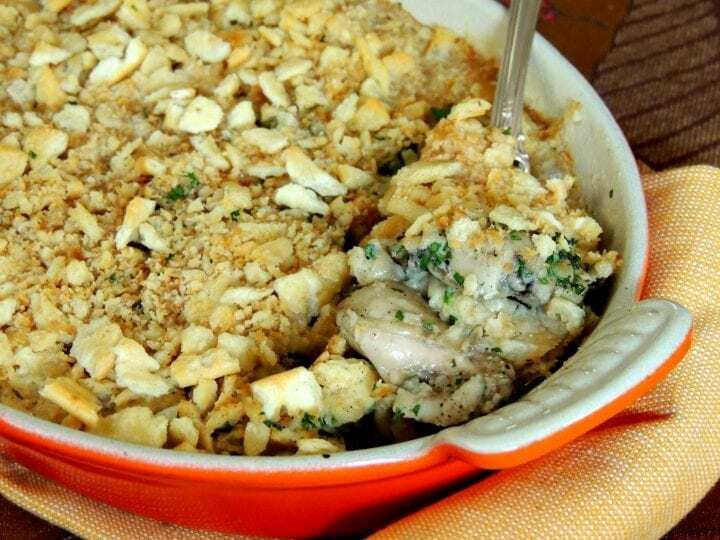 A weeknight supper workhorse, this casserole is usually made with a cream of mushroom soup, but the flavors are so much fresher and better with a homemade sauce. The Salt Table’s Southern Spring Blend makes seasoning it a snap so the sauce goes together almost as quickly as opening that can. 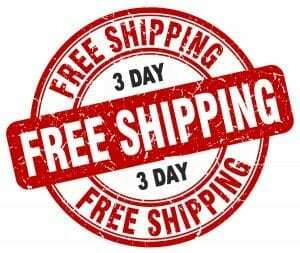 Other perfect blend combinations are All ‘Round Good Grinder Blend, Southern Herb Garden Blend, Southern Italian Blend, and River Street Cobblestone Blend. Change it up by adding celery and or peas to it or by changing the cheese to Gruyere or Swiss. Put 3 quarts of water on to boil in a large pot over high heat. Position a rack in the center of the oven and preheat it to 350° F.
Meanwhile, film a large skillet with oil and heat over medium heat. Crumble in the beef and brown (in batches if necessary to keep from crowding meat), about 2-3 minutes. Remove with slotted spoon and season it lightly with Southern Spring Blend. Add the onion to the pan and sauté until softened about 2 minutes. Add the carrot and sauté 2 minutes longer. Whisk in the flour, blending until smooth, then slowly whisk in the broth and milk. Cook, stirring constantly, until it’s bubbly and thick. Season to taste with Southern Spring Blend, adjust heat to slow simmer, and cook 3-5 minutes, stirring occasionally. Fold in the beef, let it come back to a simmer, and turn off the heat. When the water is boiling, stir in a small handful of salt and macaroni. Cook until softened but still not done (about half the time recommended on the box) . Meanwhile, butter a rectangular 2-quart casserole dish. 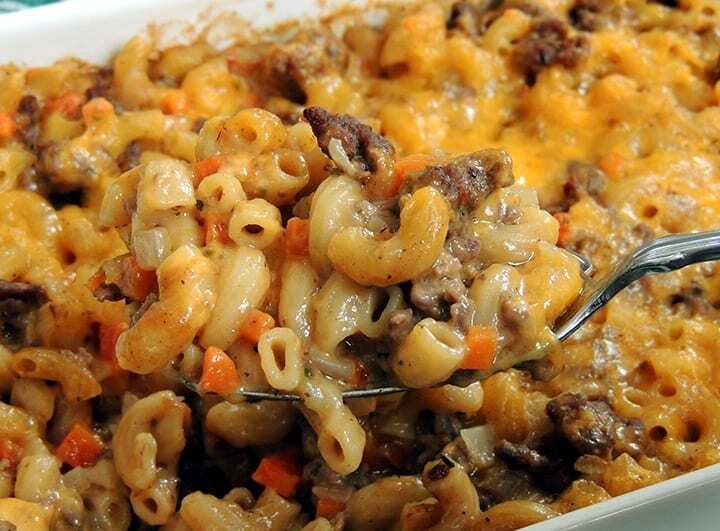 Drain and add the macaroni to the casserole. Add the beef and sauce mixture and 1 cup of the cheese. Gently toss to mix and level with spatula. Sprinkle remaining cheese evenly over top. Bake until bubbly at the center and the cheese is lightly browned, about 30 minutes. Let it rest 10 minutes before serving. Southern Italian Blend is a perfect pairing with white beans, whether they’re served hot or cold and whether the beans are cannellini, (Italian white kidney beans), Great Northern, or even Navy beans. It’s a great side dish on its own with almost any grilled food. My favorite easy summer lunch is to mix this with two well-drained six-ounce cans of solid light tuna packed in olive oil. I offer lemon wedges on the side for that. Other appropriate Salt Table blends for seasoning this salad would be Southern Herb Garden and All ‘Round Good Grinder Blend. If you’re using canned beans, drain and rinse them well. 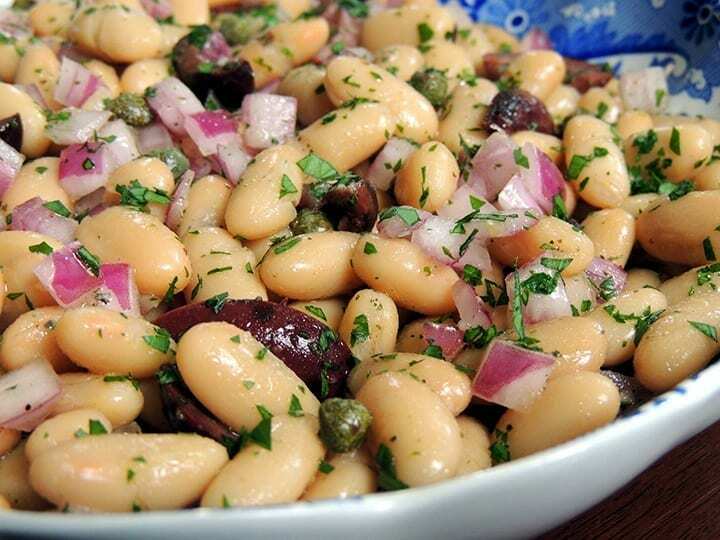 In a mixing bowl, toss together the beans, onion, capers, olives, and 1 tablespoon parsley. Season well with Southern Italian blend, to taste, sprinkle with enough oil to lightly coat the beans and gently toss until they’re evenly coated. Sprinkle lightly with vinegar, to taste, toss, and let stand 30 minutes. 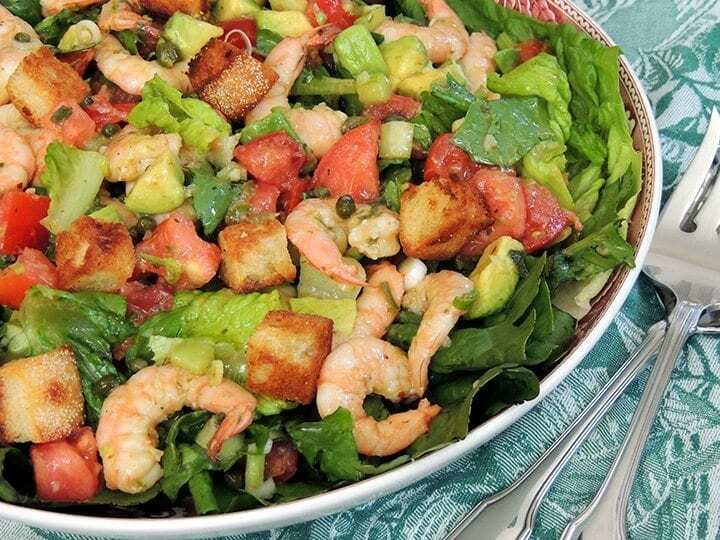 Taste and adjust the vinegar, oil, and seasoning blend, gently toss, and if liked serve the salad over lettuce leaves. Sprinkle the remaining parsley over the salad just before serving. 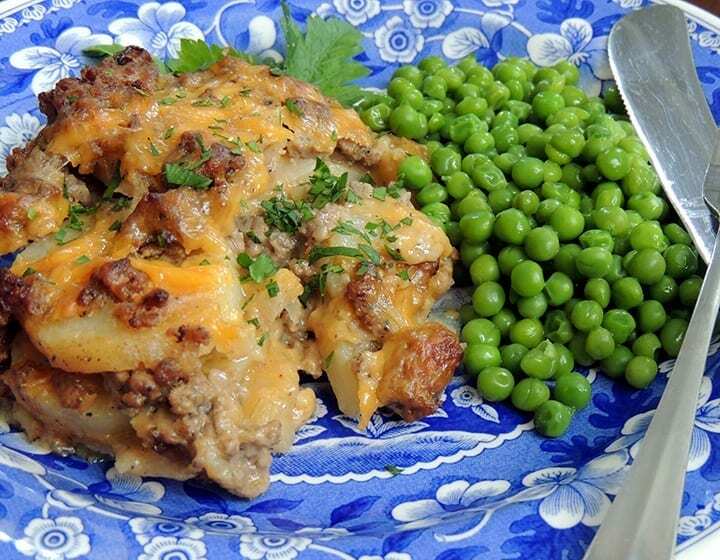 This is based on the taste memories of the frugal casseroles my mother would invent in an effort to get her picky child (me) to actually eat budget-friendly hamburger meat. She would have loved having Hostess City Southern Hospitality Blend to simplify the seasonings. It’s a perfect mate for beef and potatoes. 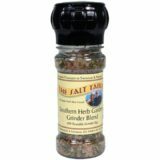 Other great Salt Table blends for this are Southern Herb Garden, All Round Good Grinder Blend, Southern Italian, and River Street Cobblestone Blends. Peel and slice the potatoes ¼-inch thick. Put them into a 2½-3-quart saucepan, cover with water, add a large pinch of Sea Salt, and bring to a boil. Adjust the heat to a steady simmer and cook until the potatoes are barely tender, about 5 minutes. Drain and let cool enough to handle. Adjust the heat to medium, add the onion, and sauté until softened and golden, about 5 minutes, then add the garlic and stir until fragrant. Sprinkle in the flour and stir until bubbly and smooth. Slowly whisk in the milk and broth and it bring to a simmer, stirring constantly. Cook, stirring, until thickened and adjust the heat to a simmer. Season well with Hostess City Southern Hospitality Blend Blend, stir, and simmer 5 minutes. Taste and adjust the seasoning and turn off heat. Smear the bottom of a rectangular 2-quart casserole with a little sauce. Cover it with a layer of potatoes and scatter 1/3 of the meat over them. Sprinkle on 1/3 of the cheese and spoon 1/3 of the sauce over. Add a second layer of potatoes, another 1/3 of the meat, 1/3 of the cheese, and 1/3 of the sauce. Repeat once more with the remaining potatoes, meat, and sauce, then sprinkle the remaining cheese evenly over the top. Bake in the center of the oven until bubbly to the center and the topping cheese is lightly browned. Let it rest 10 minutes before serving. This lighter rendition of Eggs Florentine actually is from Florence (Italy, of course, not South Carolina). Perfect for spring weather, it can be served over pan-toasted bread: Butter 8 slices ½-inch-thick crusty Italian bread and pan-grill it over medium heat until browned on both sides. If using fresh spinach, wash it in several changes of water and remove any tough stems. Put it into a lidded skillet with the water that’s clinging to it, cover, and cook over medium high heat until just wilted. Drain, cool enough to handle, and squeeze out excess moisture. If using frozen spinach, omit the preliminary cooking and squeeze out any excess moisture. Heat the sauce over medium low heat. If liked, season it lightly with Hostess City Southern Hospitality blend. Keep it warm. Put the oil in a skillet over medium high heat. Add the spinach and season lightly with Hostess City Southern Hospitality blend. Sauté, tossing often, until it’s hot through, tender, and dry, about 2 minutes. Turn off the heat. Mix in ½ cup Parmigiano or more, to taste, taste adjust the seasoning. Divide the spinach among 4 warm plates. Top each serving with 2 eggs and grind a little Hostess City Southern Hospitality blend over each egg. 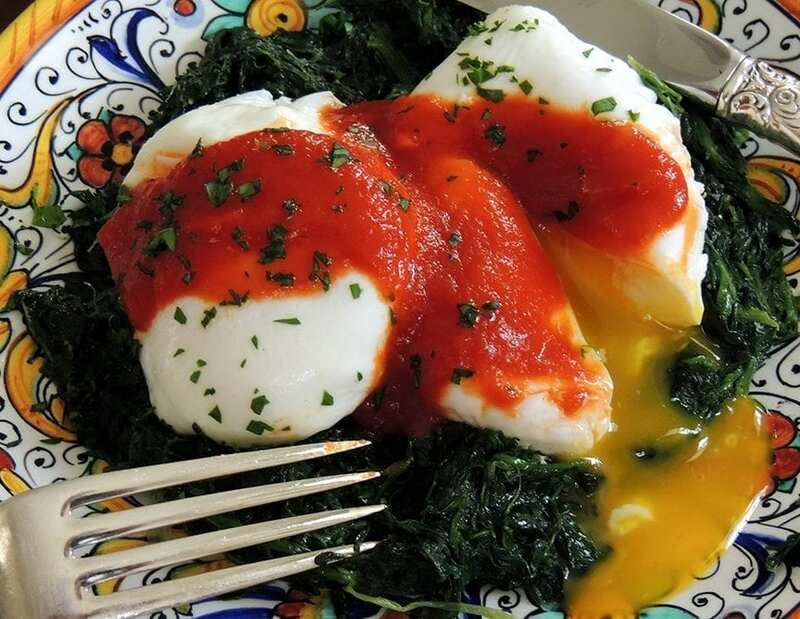 Spoon the tomato sauce evenly over the eggs and lightly sprinkle with cheese. Serve at once with more cheese passed separately. If you’re planning to make the eggs ahead, prepare a large basin of ice water. Put at least 2 and up to 4 inches of water in a deep, lidded saucepan. Turn on the heat to high, cover, and bring the water to a boil, then add the vinegar and reduce the heat so that it bubbles steadily but isn’t boiling hard. One at a time, break each egg into shallow bowl and slip into pan at point where water is bubbling. Let it settle and gently turn it to help egg form oval. Add up to 3 more eggs in the same way. When all the eggs are in pan, let them simmer until their whites are set and yolks are still quite soft, about 1½ to 2 minutes. Remove them with slotted spoon, let them drain thoroughly, and trim any loose tendrils of egg white. Serve immediately while still warm. If you’re making the eggs ahead, immediately slip them into the ice water bath until they’re chilled. Store them in cold water until needed (refrigerated if holding more than a couple of hours). To reheat them, drain and drop into large pan with at least 1½ inches simmering water and heat until warmed through, about ½-to-1 minute. Serve warm. This recipe is adapted from Beans, Greens, & Sweet Georgia Peaches, Second Edition, by Damon Lee Fowler (Globe Pequot Press/2014). 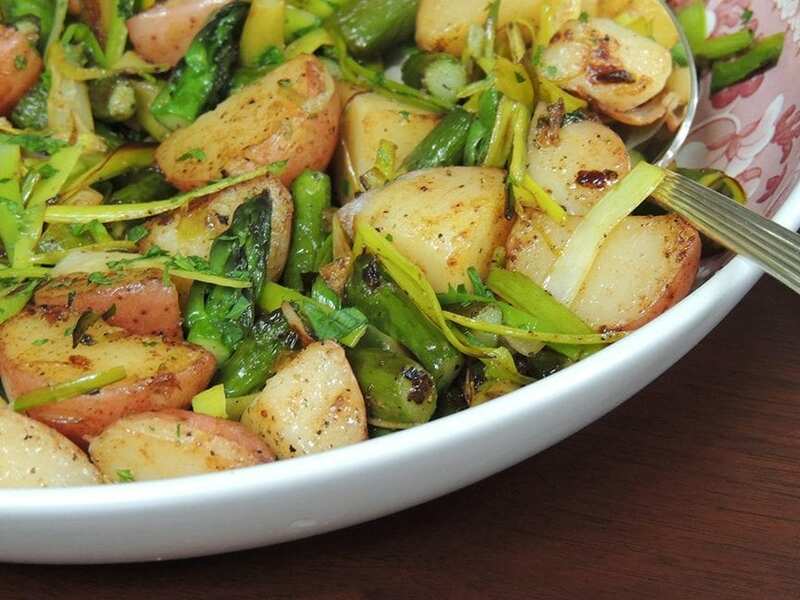 The original had parsley, salt, and pepper as seasonings, but the herbs and lemon essence blended into The Salt Table’s Hostess City Southern Hospitality Blend are perfect mates for spring asparagus, new potatoes, and leeks. It really adds a boost the flavor and condenses the condiments into a single ingredient that requires only a few shakesr. Bring at least an inch of water to a boil over medium high heat in a heavy bottomed pot. Put the steaming basket or insert in or over the pot, add the potatoes, cover, and reduce the heat to medium. Steam until the potatoes are just tender and can be pierced easily with a sharp paring knife, about 8-10 minutes. Let them cool, and if making them ahead, cover and refrigerate. They can be precooked as much as a day ahead. Meanwhile, wash and trim the asparagus, peel the tough lower part of stem, and cut it into 1-inch lengths, keeping the tips separate from stems. Slice the leek greens crosswise into 2-inch lengths, then cut into thin strips. When ready to finish the sauté, cut the potatoes into 1-inch pieces (halves if small, quarters if larger, eighths if really large). Melt the butter in a large skillet or sauté pan over medium high heat. Add the asparagus stems. Stir-fry, tossing frequently, until they’re bright green and beginning to soften, about 3 minutes. Add the potatoes and continue tossing until beginning to turn golden, about 3 minutes longer. Add the leek greens and asparagus tips and season well with several grindings of Hostess City Southern Hospitality blend. Stir-fry, tossing frequently, until the asparagus is crisp-tender and beginning to brown, but still firm and bright green. Stir in the parsley if using and turn off the heat. Taste and correct Hostess City Southern Hospitality blend and serve at once. Our “roasting” is really roasting but high temperature baking, but never mind: This is a popular and simply beautiful way to prepare fresh spring vegetables. The special blend of herbs in The Salt Table’s Hostess City Southern Hospitality Blend are the perfect seasoning for this method and simplifies the preparation since the seasonings are already perfectly blended. Position a rack in the upper third of the oven and preheat to 450° F. Trim off all but 1 inch of the carrot tops. Wash, and if they’re not freshly gathered, peel, and cut them on the diagonal into 2-3 pieces. Wash and trim the radishes, leaving an inch of their tops attached, and halve them. Scrub the potatoes and halve them. Trim and peel the shallots, but leave them whole. Wash the turnips and trim them, leaving 1 inch of tops attached, then halve or quarter them. Drizzle a large, heavy-bottomed roasting pan or heavy rimmed half-sheet pan with oil. Spread the vegetables on the pan, drizzle with more oil, and toss to mix and coat. Spread them flat (they should have room around them) with the potatoes cut-side-up, and season well with Hostess City Southern Hospitality Blend. Roast 8 minutes, stir, turning potatoes cut side down, and roast, stirring occasionally, until tender and lightly browned, about 10-15 minutes more. Taste and adjust the Hostess City Southern Hospitality Blend. Toss well and sprinkle with the optional parsley or other herbs, if using. Serve at once directly from the roasting pan. The herb blend in The Salt Table’s Hostess City Southern Hospitality Blend, enhanced with lemon essence and sea salt, is ideal for most any fish but is especially compatible with spring salmon. Roasting in a hot oven is a simple way to cook fish fillets that is easy even for novices. Position a rack in upper third of oven and preheat to 450° F. Season the fish on all sides with Southern Springtime Blend. Rub a roasting pan, rimmed sheet pan, or large metal (copper or enameled iron) gratin with oil and put in the filets, skin-side down. Drizzle with more oil. Roast until the fish is done to your taste, about 10 minutes per inch of thickness. Sprinkle with Hostess City Southern Hospitality Blend and serve it from the pan or transfer it to individual plates and serve immediately. Potato gratins don’t have to be heavy with white sauce or cream or, for that matter, loaded with cheese to be good. The Salt Table’s Hostess City Southern Hospitality Blend is an ideal pairing for new potatoes and pairs well with Parmigiano-Reggiano cheese and a couple of fresh green onions to brighten the flavor. Prepare a heavy-bottomed pot with at least 1 inch cold water and a steamer insert (the water should not touch the insert). Cover and bring it to boil over high heat. Meanwhile, scrub the potatoes under cold running water. Add them to the pot, cover, and steam 2 minutes. Adjust the heat to medium and steam until the potatoes are just tender, about 15-20 minutes, depending on their size. Remove them from the pot and let them cool enough to handle. Butter a 2-quart gratin dish or shallow casserole. Slice the potatoes and arrange them in rows in dish, overlapping and scattering the onions among the potatoes and seasoning each row with Salt Table Hostess City Southern Hospitality Blend . Sprinkle each row with a little Parmigiano and as you go, reserving ¼ cup for topping the gratin. Drizzle each row with butter, reserving 1 teaspoon for the crumbs. If any onions remain, scatter them over top. The gratin can be made several hours ahead to this point. Cover well. 45 minutes before serving, position a rack in the center of the oven and preheat to 375° F. Sprinkle the gratin with the remaining Parmigiano-Reggiano. Melt the remaining teaspoon of butter over low heat in a small skillet. Add the breadcrumbs and stir until they evenly absorb the butter. Sprinkle the buttered crumbs over the top and bake in the center of the oven until it’s hot through and the top is lightly browned, about 20-25 minutes. Let settle 5 minutes before serving. Based on a classic dish from the traditional cooking of Genoa, Italy and a strikingly similar dish that my mother made often during my childhood, this is so easy to put together and the All Round Good Grinder Blend is a perfect seasoning to enhance its earthy character. Other Salt Table Seasonings that are perfect for this dish are Tybee Island Coastal Blend, Spanish Moss Blend, and Southern Italian Blend. 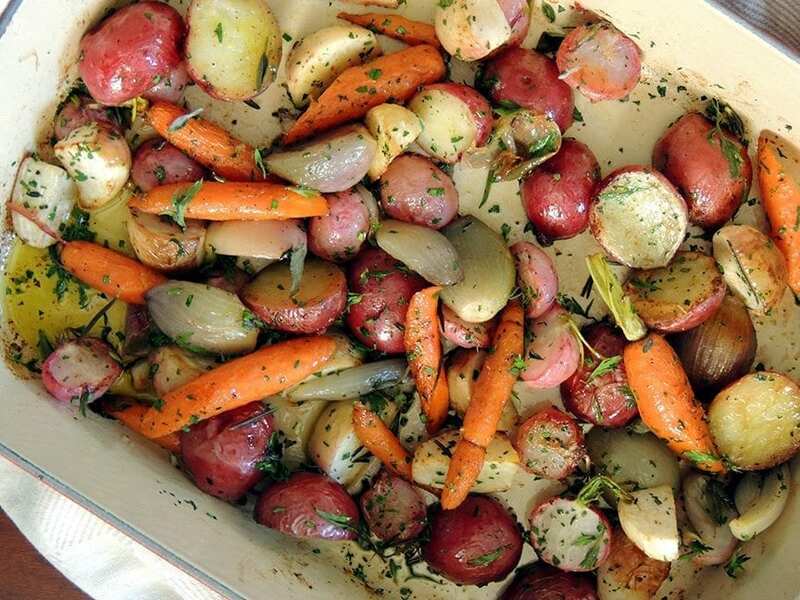 Position a rack in the upper third of the oven and preheat to 450° F. Scrub the potatoes under cold running water. Peel and slice as thinly as you can—no more than 1/8-inch-thick. Lightly rub a 9 x 13-inch bake-and-serve dish with butter or oil and put in the potatoes. Scatter half the onions over the potatoes and drizzle them with 4 tablespoons of oil. Toss gently to coat and then season liberally with All Round Good Grinder Blend. Toss, and spread them so that all the potatoes are lying flat. Bake in the upper third of the oven until the onions wilt and begin to brown and the potatoes are beginning to get tender, about 15-20 minutes. 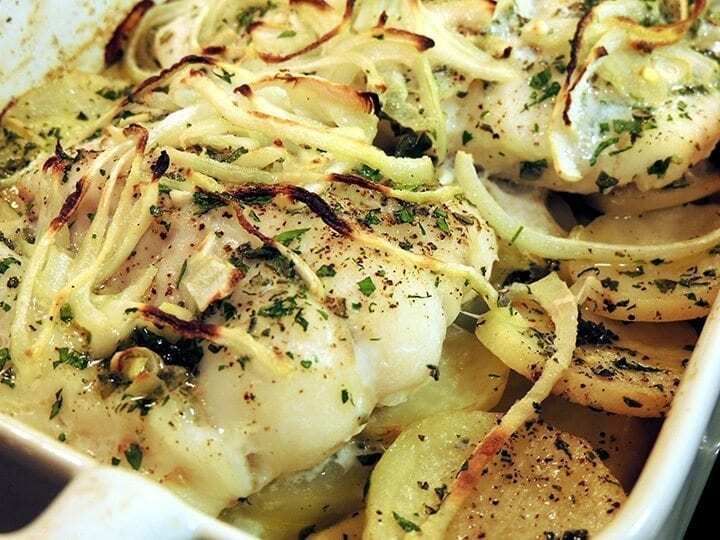 Remove the dish from the oven, toss the potatoes again, and lay the fish fillets over the top in a single layer. Season them well with Good Grinder Blend, then scatter the remaining onions over the fish, drizzle with the remaining oil, and bake until the potatoes and fish is just cooked through and the onions are lightly browned, basting occasionally with the oil in the dish, about 15-20 minutes more, depending on the thickness of the fillets. Serve hot from the baking dish. Equally perfect for busy weeknight dinners as well as weekend entertaining, these crumb-topped fillets are simple to put together, even more-so when they’re seasoned with All Round Good Grinder Blend. They would also be delightful with Tybee Island Coastal Blend or Southern Italian Blend. Position a rack in the upper third of the oven and preheat to 450° F. Put 1 teaspoon of olive oil in a small skillet over medium heat. When the oil is warm, sprinkle in the crumbs and toss until they’re coated evenly. Turn off the heat. 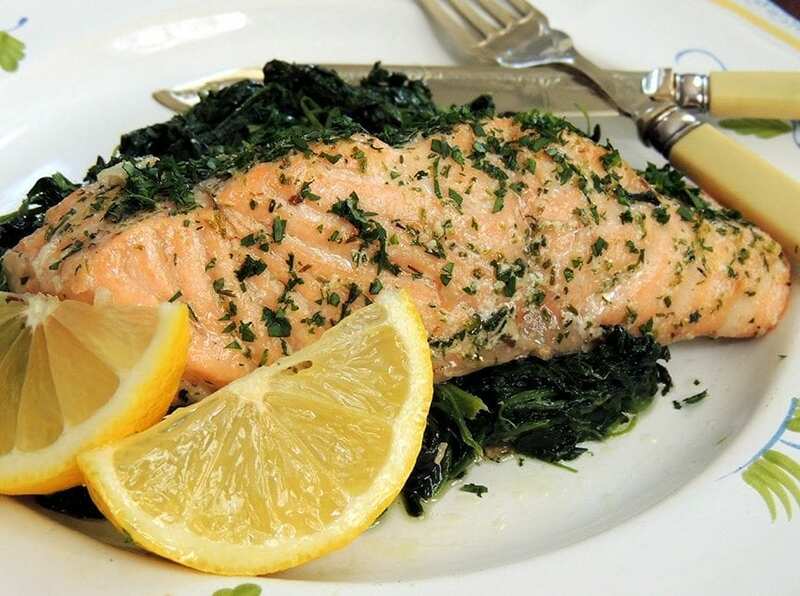 Rub the bottom of a baking dish that will snugly hold the fish in one layer with olive oil. Pat the fish dry, put them into baking dish, skin-side down, and season well All Round Good Grinder Blend. Sprinkle them with the parsley if using and then the oiled crumbs. 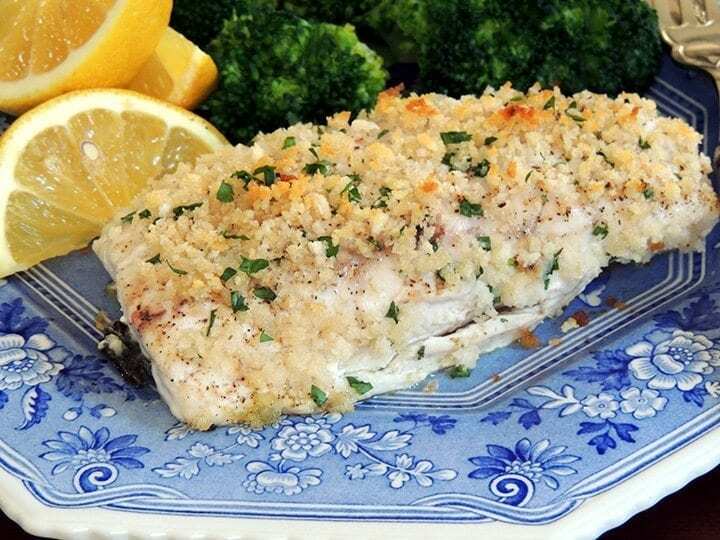 Bake until the fish is cooked through and the crumbs are toasted, about 8-15 minutes, depending on thickness of fillets. Serve at once with lemon wedges. Even if the ready-made boxed crumbs were from good bread (they aren’t), their texture and flavor is never as good as those that are homemade, and making your own is not enough trouble to justify taking the short cut. Here is my method. Preheat the oven to 250 degrees F. Trim the crust from stale, unflavored (without sugar, herbs, garlic, cheese, olives, etc.) European-style bread and cut into 1-inch cubes. Spread the cubes on a rimmed baking sheet in one layer. Bake, stirring occasionally, until dry and crisp and just barely golden. Let them cool completely. In batches, transfer to a sealed freezer bag and crush to crumbs with a rolling pin. You may also process in a food processor fitted with a steel blade until evenly ground. Keep in mind that the dry, crisp bread is likely to scratch the sides of the plastic work bowl over time. If you want to keep that from happening, go to the trouble of crushing them by hand. Dry crumbs keep indefinitely when stored in airtight tins. Adapted from my book Ham: A Savor the South® Cookbook, this hearty sauce is simplified by seasoning it with All Round Good Grinder Blend. Southern Italian Blend would be another excellent seasoning as would Cobblestone Blend. I serve it as a main dish followed by a simple mixed green salad. Heat the butter (or butter and oil) in a large (3 quart) sauté pan over medium heat until hot and bubbly. Add the ham and sauté until it’s beginning to color on the edges. Add the onion and sauté until golden, about 3-5 minutes. Add the garlic and rosemary (if using) and toss until fragrant, about half a minute. Season well with Good Grinder Blend. Pour in the wine and bring to a boil, stirring and scraping the bottom of the pan to release any browned cooking residue. Let it boil until it is mostly evaporated, about 3 minutes. Stir in the tomatoes, bring it to a boil, and reduce the heat to a steady simmer. Simmer, stirring every now and again, until the sauce is thick, about 20 minutes. Taste and adjust the Good Grinder Blend and turn off the heat. Meanwhile, bring 4 quarts water to a rolling boil in a 6-8 quart pot. Toss in at least 1 rounded tablespoon Halle or Himalayan Pink salt, stir, and stir in the pasta. Cook until al dente (firm to the bite, but cooked all the way through and not pasty at the center). 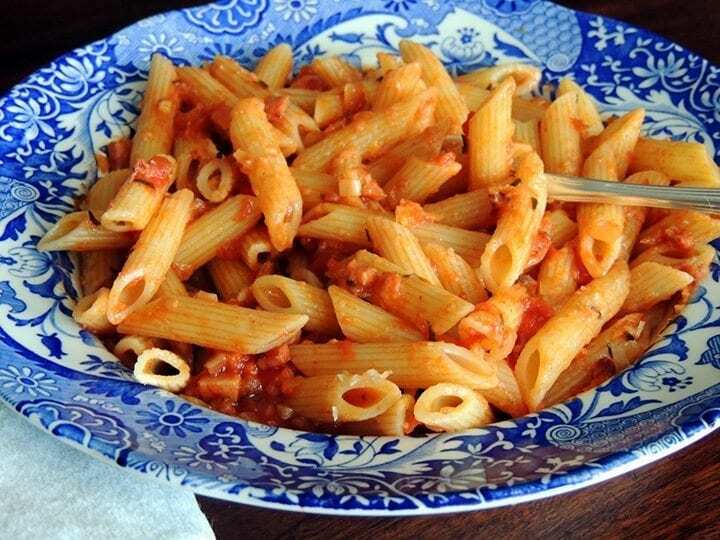 When the pasta is almost done, gently reheat the sauce over medium low heat. When the pasta is ready, drain it quickly, being careful not to over-drain it, and immediately toss it with the sauce. Sprinkle ½ cup of the cheese over it, toss well, and serve immediately, passing the remaining cheese separately. We don’t often give leeks a starring role on their own, but in the spring when they’re fresh and new they make a great vegetable side dish. The Salt Table’s Shamrock Dust is the perfect seasoning to bring out their freshest and best spring flavor. Trim the roots and withered leaves from the leeks. Trim the green tops to a uniform length that will fit into the gratin dish. Holding them root-end-up, wash well under cold running water, bending back the leaves to get all the grit between the layers. If you’ve not been able to find slender leeks, cut them in half lengthwise. Drop them into a basin of cold water. Put enough water to half cover the leeks in a wide, shallow skillet that will hold them in one layer. Bring it to a boil over medium heat. Drain the onions and add them to the pan. Loosely cover, let it come back to a boil, then uncover, add a healthy pinch of Pink Salt, and reduce the heat to medium. Simmer until just tender, about 8-10 minutes. Butter a large oval gratin dish. Remove the leeks with a slotted spatula or tongs, drain well, and transfer them to the prepared dish. Season them with Shamrock Dust. Raise the heat under the skillet to medium-high and boil the liquid down to 2 tablespoons. Add the cream and let it come to a boil. Let it boil until it’s lightly reduced and slightly thickened. Pour the cream evenly over the leeks. You may make it through this step as much as 4 hours ahead. Let cool completely and loosely cover. Refrigerating is not necessary. 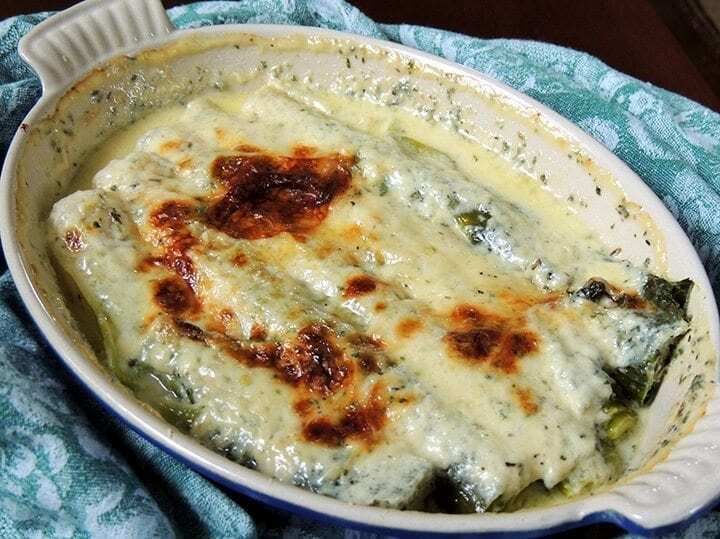 About 45 minutes before serving, position a rack in the center of the oven and preheat to 450° F. Sprinkle the leeks with the Parmigiano-Reggiano and bake until golden and bubbly, about 20-25 minutes. Serve warm. * Other Salt Table Blends that are great with these and other green onions are All ‘Round Good Grinder Blend and Southern Italian Blend. The classic schnitzel is made with veal, but cutlets made from pork tenderloin (or even chicken boned breasts) take handsomely to the technique at a fraction of the cost of veal, and for my money, the pork has far more flavor. Salt Table’s Halle & Savannah Blend is ideal for schnitzel, but classic All ‘Round Good Grinder Blend and Southern Italian Blend are also great for them. Trim the tenderloin, removing the silver-skin and fat. Cut the thickest part of the center crosswise into 4 equal rounds 1¼-inches thick. Set aside the ends for another use. Put the 4 center cuts round side up on a sheet of plastic wrap spread over a sturdy work surface. Lay a second sheet of wrap over them and lightly pound them out to a little less than ¼-inch thick. Generously grind the seasoning blend over both sides. If using veal or chicken cutlets instead, lightly pound them out to a uniform thinness just under ¼-inch and season as for the tenderloin. Season the crumbs with several grindings of Seasoning Blend and spread them on a plate or wide, shallow bowl. Have the flour spread on a plate and the egg in a wide, shallow bowl. 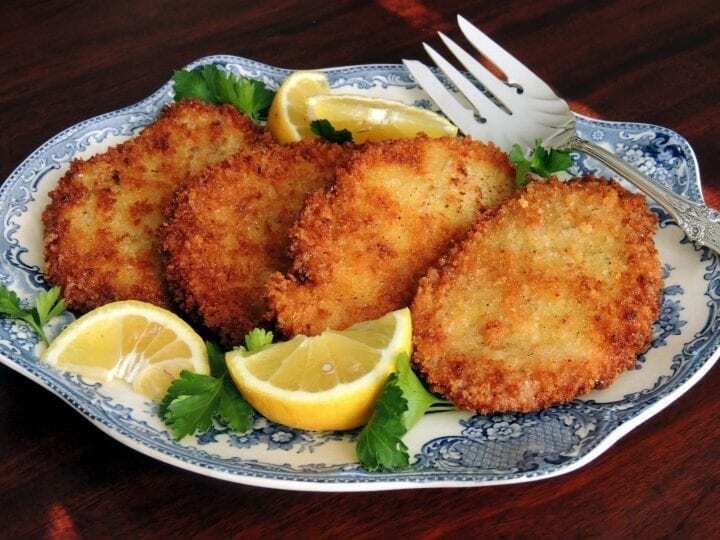 Dust the cutlets with flour, coating both sides, and gently shake off the excess. One at a time, dip them in the egg, coating both sides and allowing the excess egg to flow back into the bowl, then lay it on the crumbs, turning and patting to coat both sides. Put the breaded cutlets on a clean, dry plate or wire cooling rack and them let stand 30 minutes to allow the breading to set. Position a rack in the upper third of the oven and preheat it to 200° F. or the warm setting. Over medium heat, melt enough clarified butter (or the unsalted butter and enough oil) to cover the bottom of heavy-bottomed skillet by at about ¼-inch. When it’s hot, raise the heat to medium-high and put in enough cutlets to fill the pan without crowding. Fry until the bottoms are golden brown, about 2-3 minutes. Turn and brown the second side, about 2 minutes longer. Remove them from the pan to a wire cooling rack and keep warm in the oven while the remaining cutlets fry. Serve hot with lemon. Note: chicken cutlets are a boned and skinned breast half split horizontally into two equal pieces. 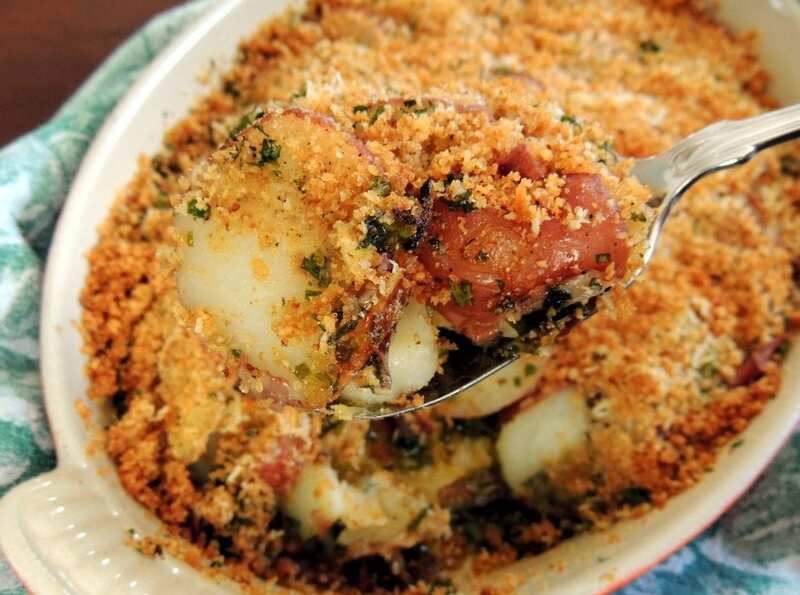 Tybee Coastal Blend makes this simple, traditional gratin a snap to make, since the separate seasonings that usually go into it are all contained in one convenient grinder, with the added flavor bonus of other seafood-enhancing seasonings such as mustard, dill, shallots, green onions, and chives. Position a rack in the center of the oven and preheat it to 350° F. Drain the oysters, reserving half a cup of their liquor. Pick through the oysters for bits of shell. Roughly break the crackers into very coarse crumbs. Melt the butter over medium heat in pan large enough to hold cracker crumbs. Add the crumbs and toss until they’ve evenly absorbed the butter and are toasty, about 2 minutes. Lightly butter a 9-inch square baking dish or 10-12-inch oval gratin dish. Sprinkle a fourth of the crumbs over the bottom. Spread half the oysters over the crumbs, season lightly with Tybee Island Blend and sprinkle with 1 tablespoons of the parsley and a third of the remaining cracker crumbs. Spread the rest of the oysters over the top, lightly season with more Tybee Island Blend, and sprinkle with the remaining tablespoon of parsley and half the remaining crumbs. Pour the oyster liquor around, then add half and half just to top of crackers. Cover with the remaining crackers, finish with another sprinkle of Tybee Island Blend, and bake 35-40 minutes or until puffed and golden. Serve at once. 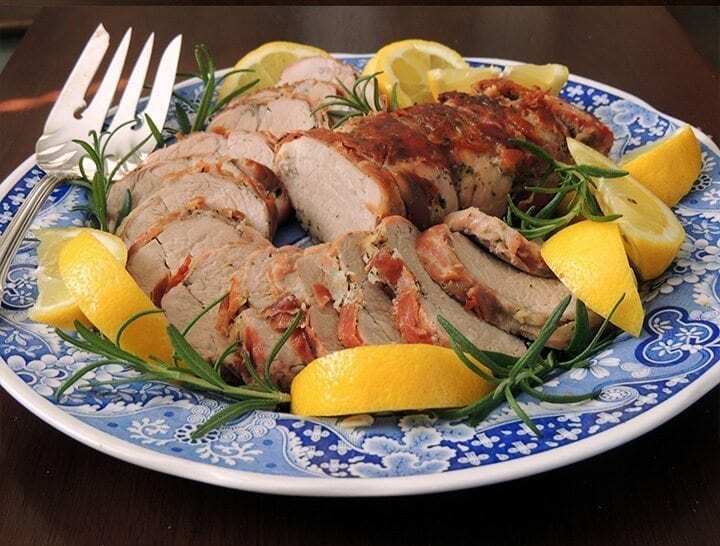 Pork tenderloins are the leanest and most tender part of the pig, but they’re also the least flavorful and can become dry if they’re overcooked. A generous dose of Southern Italian Blend takes care of the former, and a protective wrapping of prosciutto takes care of the latter. These can be grilled or roasted, so they’re perfect for your cookouts or any special dinner! Trim the tenderloins and remove the silver skin with a sharp knife. Rub their entire surface lightly with oil. Generously grind Southern Italian Grinder Blend over all sides, patting it into the surface. Wrap each tenderloin with prosciutto, completely covering it, and tied it securely with kitchen twine. Either prepare a grill with hardwood coals to a medium-hot fire or position a rack in the upper third of the oven and preheat to 425° F. If roasting, skip to step 3. To grill them, brush them with oil and put them on the grill over direct heat. Grill, turning as needed, until all sides are seared, about 2-3 minutes per side. Move to indirect heat (or put them in a flame-proof pan on the coolest part of the grill), cover, and cook to an internal temperature of 135° for medium, about 15 minutes longer. To roast them in the oven, rub a roasting pan with oil, put in the tenderloins, and drizzle with them with more oil. Roast 20 minutes in the upper third of the oven and reduce heat to 350°. Roast until meat reaches 135° for medium, about 10-15 minutes longer. Put the bread in a mixing bowl and drizzle enough milk over it to saturate it. Let it soak for a minute, then squeeze it dry, discarding the milk. Crumble the bread into the bowl. Crumble in the beef and add the onion. Season well with Southern Italian Blend and mix until everything is evenly blended. Moisten your hands with water and form the meat into 1½-inch balls. Put enough oil in a 3-4 quart Dutch oven to cover the bottom by ¼-inch and put it over medium heat. When it’s hot, raise the heat to medium high, add enough meatballs to fill the pan without crowding, and brown them on all sides, about 3 minutes. Remove them with a slotted spoon to a plate and repeat until all the meatballs have been browned. Drain and discard the browning oil and wipe out the pan, but don’t wash it. Add 1 tablespoon of olive oil and the onion and return the pot to medium heat. Sauté, stirring often, until the onion is softened and golden, about 4-5 minutes. Add the garlic and sauté until fragrant, about half a minute, then pour in the wine. Bring it to a boil and cook until it loses its sharp alcoholic aroma. Add in the marinara, bring it to a simmer, and simmer about 5 minutes, stirring occasionally. Add the meatballs to the sauce, bring it back to a simmer, and adjust the heat to a slow, steady simmer. Simmer until the sauce is thick and the meatballs are very tender and deeply flavored with the sauce, at least 1 hour—longer won’t hurt. The meatballs can be served as a meat dish, on toasted sandwich rolls as a sandwich filling, or as a sauce for pasta. To serve the meatballs with pasta, bring 4 quarts water to a rolling boil. Stir in a small handful of salt and the pasta, bring it back to a boil, and cook, stirring occasionally, until al dente (firm to the bite), using the package directions as a rough guide. 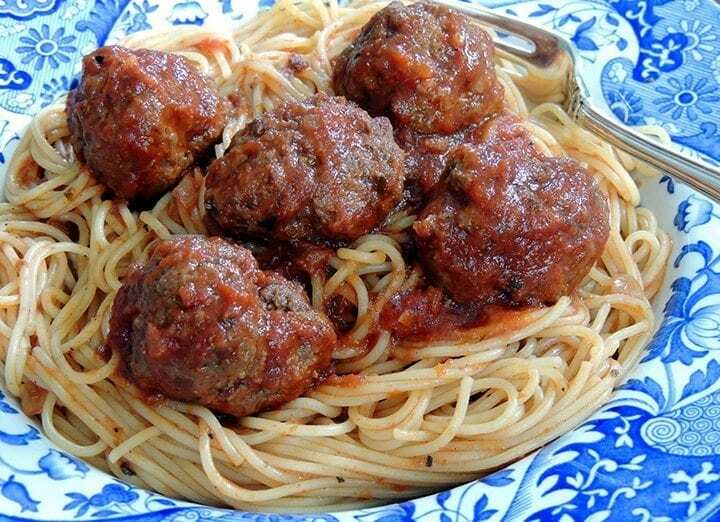 Drain and toss with a cup of sauce, then serve topped with meatballs, passing the cheese separately. You can use a jar of marinara for the above recipe, (they’re right at 4 cups) or make your own: it’s easy with The Salt Table’s Southern Italian Grinder Blend. Southern Italian Blend has garlic powder in it, so you can omit the fresh garlic, although it freshens the flavor. Put the oil and onion in a 3-4-quart Dutch oven over medium heat. Sauté until the onion is pale gold, about 5 minutes. Add the garlic, if using, and sauté until fragrant, about half a minute. Add the tomatoes and season well with Southern Italian Blend. Bring it to a boil, then adjust the heat to a slow, steady simmer, and let it cook, stirring occasionally, until the sauce is thick and the flavors are well-blended, about half an hour. Stuffed vegetables are popular with Italian cooks, particularly in Liguria, the coastal province that’s also known as the Italian Riviera. These are most often offered as an antipasto (appetizer), but they’re substantial enough to serve as a light main dish for lunch or supper. 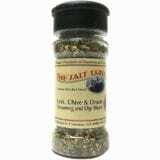 The Salt Table’s Southern Italian Grinder Blend is a perfect pairing with the flavors of this, but other great seasoning combinations are River Street Cobblestone Blend and Southern Herb Garden Blend. 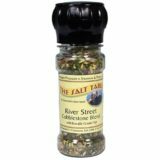 Salt Table Southern Italian Grinder Blend, or River Street Cobblestone Blend, or Southern Herb Garden Blend. Position a rack in the upper third of the oven and preheat to 375° F. Scrub the squash under cold running water. Put them in a wide, shallow, lidded pan and add just enough water to cover. Lift out the squash, cover the pan, and bring the water to a boil. Return the squash to the pan, cover, bring it back to a boil, then uncover, reduce the heat, and simmer until barely tender, about 10 minutes. Drain and let them cool enough to handle. Split them lengthwise and carefully scoop out centers, leaving a ¼-inch shell. Lightly season these with Southern Italian Blend. Roughly chop the pulp. Put the shallot and butter in pan over medium heat. Sauté, tossing occasionally, until softened, about 4 minutes. 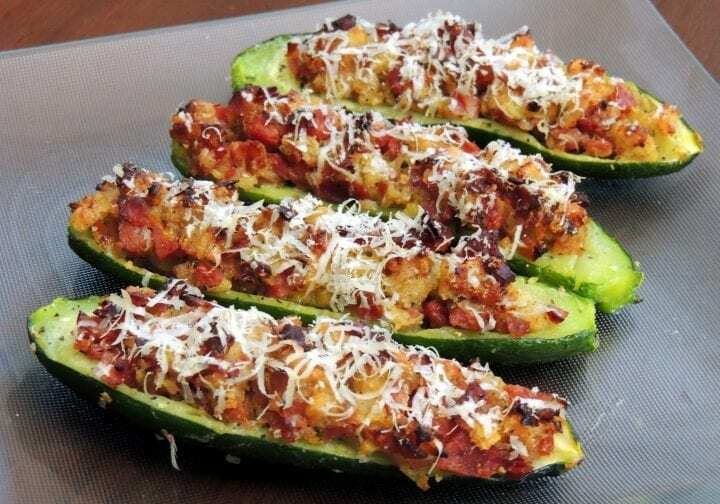 Add the zucchini pulp and cook until its liquid is evaporated. Add the prosciutto, toss until hot, and turn off heat. Stir in the crumbs and all but 3 tablespoons of the Parmigiano cheese. Season well with Southern Italian Blend and toss well to mix. This recipe also works well with River Street Cobblestone Blend, or Southern Herb Garden Blend.